(APN) ATLANTA — The News Editor and founder of Atlanta Progressive News, Matthew Charles Cardinale, is pleased to announce the publication of a memoir entitled, Tales of Audacity at the Turn of the Millennium. Written to the future, the book is intended to serve as a historical artifact of life in the United States at the turn of the millennium. Because it is about the turn of the millennium, the book is priced at $19.99. “I believe that people in the future are going to have a lot of questions about this time period, especially as it relates to our collective inaction around climate change and environmental disaster,” Cardinale says. “The book tells the story about how I navigated our complex and troubled society to contribute to progressive social change in the most impactful way I could come up with at the time, being just one person with limited access to resources,” he says. The book is 352 pages and is published by Amazon. It is available on Amazon.com and through Atlanta Progressive News in paperback; and on Kindle in e-book format. APN is offering signed copies for direct purchase through APN, and all proceeds from direct purchases go to APN. The book has three parts. Part One of the book tells the story of how the author left home at the age of fourteen and navigated the shelter system as a homeless youth in South Florida from 1995 to 1998. It is based on journals that he kept at the time. “There aren’t a lot of first-hand accounts of what it is like to be a homeless teenager. Most people wouldn’t know the first thing about the shelter system and the few options that are available for homeless youth,” Cardinale says. In 1997, with the help of an adult friend named Bill Shoemaker, Cardinale became legally emancipated, meaning he became a legal adult at age sixteen. At sixteen, he got his own apartment through a program called Rights of Passage offered by Covenant House Florida. Covenant House Georgia also has an ROP program here in Atlanta. Part Two of the book tells about how the author became a full-time political activist and agent for progressive social change in New Orleans, Louisiana; how he became concerned about the state of democracy in the U.S.; and how he ultimately decided that the best way to make a difference as one person would be to start a progressive news service in a city. In 2005, Cardinale had returned to New Orleans, only seven weeks prior to Hurricane Katrina, to start what was intended to become New Orleans Street News. The book tells the story of how, following the traumatic events of Hurricane Katrina, Cardinale moved to Atlanta and launched Atlanta Progressive News instead. Part Three of the book will be more familiar to readers of Atlanta Progressive News: it recounts the tales of audacity of the last thirteen years of APN’s publication as a progressive news service in Atlanta. 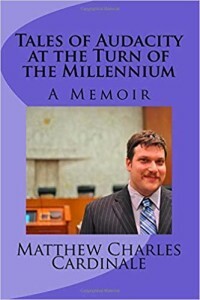 The book recounts the behind-the-scenes twists and turns of the saga in which APN’s Editor sued the City of Atlanta all the way up to the Supreme Court of Georgia with no attorney to force them to disclose how they voted during the secret vote of 2010. In addition to the extraordinary Supreme Court victory, the book recounts the numerous campaigns to bring transparency to the Atlanta City Council, including the opening of the seven Committee Briefings to the public as a result of a second lawsuit filed. Part Three of the book also recounts the efforts of Atlanta Progressive News to educate the public about many issues, including the truth about the displacement of thousands of public housing residents from 2007 to 2009. Stay tuned for information about an Atlanta-area book signing to be scheduled soon. This is quite an interesting piece. I hope to get a copy. One always starts progress and then the numbers come. Thank you Matthew Charles Cardinale for your service to our communities. I appreciate you.